But it seems that Maguire may also be having a go at Labour MPs like Catherine West, Kevan Jones, Siobhan McDonagh, and Mike Gapes, who've all asked questions in Parliament about Venezuela, and at Graham Jones MP, who had organised the debate on Venezuela and set up an All Party Parliamentary Group (APPG), having had a long-standing Latin American interest through his membership of the APPG on Latin America. In the background to his comments we have the widely circulated, and wrong, claim that Graham Jones was only setting up an APPG to hurt Corbyn. So would I be correct in thinking that the only way Corbyn’s supporters, both in the blogosphere and even the mainstream media, can think about the humanitarian disaster that is happening in Venezuela is through a Corbyn lens - And what happens when that thought-bubble meets real life? Ivor Heller is a South London resident and Director of Wimbledon AFC. His partner, Lisa, is Venezuelan. She has family including six sisters in Venezuela and Heller has listened to a "continued barrage of disturbing messages" in disbelief at the levels of anguish in their phone calls to his partner. One sister, "ordinary working class folk", was forced out of her home of 30 years by gangsters. They lost everything. Asked if they had reported it to authorities Heller laughs: "the police are in on it!" A niece called. She hadn’t eaten for three days. She was anxious about her husband, missing after going to protest Maduro's forces coming into his city and "shooting wildly everywhere." Lisa's relatives are starving. Heller has seen the photos of their dramatic weight loss and the huge lines for any food. He mentions another niece, stabbed in a mugging. The country has an appalling murder rate. The reason you saw solely daytime images of street protests was because people were afraid to be outside at night. Another Venezuelan Londoner, who asked not to be named due to concerns for her relatives, talked of “people...eating wild donkeys in Paraguana“ and of of “giant holes in roads the size of cars”. She had tried to get in touch with her dad, to get some lines from him to relate to me, but power cuts meant she could not contact him. She talked instead of Venezuela before she stopped returning in 2014. Long before the oil price fell, she had found it “too dangerous to visit any more", with an “utter loss of security” and “a lot of old people still living indoors, terrified…You could be robbed any time at gunpoint and many of my family were.” Chavismo was already failing, with “train tracks abandoned, outrageous inflation, serious food shortages, daily kidnappings, polluted beaches, rubbish all over the countryside, private companies closed, only brand names left as Venezuela stopped making stuff”. She had heard “heartbreaking stories of people losing homes and businesses they had worked for years to build - just taken." More recently, "drinking alcohol was banned at Easter” and now “an abundance of narcotics [is] readily available”. Joaquin Villalobos, the Salvadoran ex-guerrilla turned consultant for conflict resolution, told El Pais. "In the midst of chaos, the power acquired by criminal platforms is incredible." Here are some headlines from Venezuela from just the last couple of weeks. NGO reports at least eight prisoners in Venezuela have died of malnutrition so far in 2017. Catholic charity Caritas says that 41% of Venezuelans are now feeding on waste in markets. Two thirds of Caracas' buses are out of action because of a lack of spare parts. There's a 85% shortage of medicines in Venezuela, including no antibiotics for children. Blood banks are almost collapsing. The UN's Food & Agriculture agency said there are 4.1 million people with malnutrition in Venezuela. Ivor and Lisa have supported the UK charity Healing Venezuela. The couple have sent money so a relative can go to Colombia to get food but there is only so much they can do. So Ivor contacted his MP, Siobhan McDonagh, saying: "The torment of hearing family members in such distress is indescribable. We feel impotent." McDonagh agreed to meet with a group of Venezuelan-Brits in a Venezuelan restaurant in Merton, South London. She stayed for two and a half hours and was "shaken to her boots" by what she heard, according to Heller. One woman brought her mother, who she had managed to get out of Venezuela, to the meeting. The old woman was, Heller says, "just a bag of bones." He tells me that his concerns are humanitarian and he is angry at those making "political gain" out of the agonies of his family. 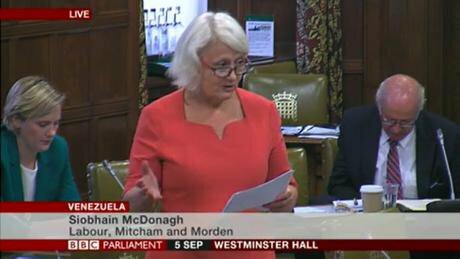 McDonagh spoke of her constituent and neighbour, Marifel, whose brother is a surgeon in a Venezuelan hospital. “Marifel showed me a photo of him holding a torch to carry out an operation due to the regular blackouts in the hospital.” She’d told the MP “Patients need to bring everything with them, from bed sheets to surgical gloves and antibiotics. The x-ray machines are not working and nor is simple equipment to take blood pressure.”. Home Office Minister Alan Duncan was at the debate . But it was noticeable that none of those in Parliament who have been ardent Chavistas turned up, as Graham Jones reminded the editor of The Morning Star of on the Daily Politics. You would think that those who froth about 'regime change' and the omnipotent CIA would welcome the opportunity to question the supposed co-conspirators, the UK government? It’s strange, too, that when Venezuela is denounced as a symbol of the failure of Bolivarian socialism, no-one points to Bolivia itself, where the Bolivarian revolution is still underway, its economy is doing fine, its poor people are doing much better, and there are no food shortages. It's not perfect but the trajectory, for now, is good. But the left almost never mentions Bolivia (barring Owen Jones, who mentioned it when he briefly broke his omerta on Venezuela, and SNP MP Martin Docherty who did mention it in the debate). Generally, it is not a left meme to shout 'Bolivia!' whenever charges about Venezuela appear - because pointing to a 'socialist' Latin America economy that's working implies that Venezuela's disaster is nothing to do with the CIA or 'economic traitors' or the oil barons. Pointing out Bolivia’s success would imply that Venezuela’s problems are all the fault of the Venezuelan regime, which unlike Bolivia has overspent so much that the oil price would have to have been just under $200, near twice its peak, to sustain the spending. As Francisco Toro explained in the Washington Post. "Turns out the difference between Bolivia and Venezuela has nothing to do with abstract ideological labels, and everything to do with fiscal prudence." A line you do hear all the time (Helen Goodman deployed it in Parliament) is to blame Venezuela’s economic difficulties entirely on the oil price drop, something which is simply not the case. Like the humanitarian disaster is the result of some unpredictable natural disaster and not the regime’s policies. There was another theme in Maguire's tweet which was hammered home at the Labour Party Conference, namely: We've triangulated and clobbering Saudi Arabia sells. Her speech mentioned Saudi Arabia eleven times, Syria once, Venezuela once - and Russia not at all. Her party banned Saudi Arabia and Sudan from attending its conference because of "war crimes" - but not Russia, who were committing war crimes in Syria on the day of her speech (or even Myanmar for that matter). Singling out Saudi Arabia (and how clearer could they be in singling them out) is popular. But what 'rules' are you enforcing? Ones which just so happen to align with Stop The War Coalition's campaigning agenda? Yet corruption kills people as surely as a bomb sold to the Saudi armed forces does.“Malnutrition in Venezuela is a problem of corruption, not a lack of money,” Maritza Landaeta, a director of the Bengoa Foundation, a Caracas-based health and nutrition charity, told the Financial Times. And the UK is a key enabler of the truly astonishing levels of corruption by the 'Boliburguesía’, the nouveau riche that Chavez created, via our famously lax financial regulation and our possession of tax havens like the British Virgin Islands. But that's not what Thornberry, a Chavez cheerleader in her time,is going to talk about. Instead it's Saudi and 'bombs!'. But it’s a hollow sort of 'turn to diplomacy' when the exclusion of Saudi Arabia led the Arab League to shutter an event at the Conference. Talking about the UN as a vehicle for peace - let alone as the sole vehicle - is obviously an Iraq dog whistle. But one that can only be blown by people who've been asleep for the past six years over Syria, Crimea and and Myanmar. Regarding Venezuela, the UN is an irrelevance. What is happening is a clunky process trying to drag the regime to the table to talk meaningfully. It involves The Vatican, Spain, the EU, and the Lima Group of countries (most of Latin America plus Canada) - plus Venezuela's remaining allies. The Lima Group has called on the Venezuelan government to act “in good faith” in proposed talks with the opposition in the Dominican Republic. But the government are playing tricks and playing games. They talk bombastically about seeking recognition of their replacement for an inconvenient parliament, their 'Constituent Assembly'. The EU Parliament has approved targeted sanctions by 10-1. They may be approved at an October 19 meeting. Canada has already imposed sanctions. The US is universally regarded as a mess on Venezuela, with the President saying one thing and US agencies doing another. There are two EU countries cited as having issues with Venezuela sanctions, Portugal and Greece - though the Greeks are already wavering. We have been here before over Russian sanctions and, in the end, the entire EU signed up. Imagine a Corbyn government dealing with either of these challenges. Corbyn himself has opposed sanctions on Russia. He has said several times that he would not defend Nato members under attack and he did it again at this year's conference. Both Corbyn and Thornberry come from a Cuba Solidarity/Venezuela Solidarity/Stop The War Coalition crowd (STWC) who actively shun natives who disagree with them. This happened with the 2014 'Revolution of Dignity' in Ukraine, where Ukrainian left forces found themselves ignored by Western ones and people like Corbyn spoke of Russia being 'provoked'. It happened with Syrians and the STWC. It happened with Syrians and this week’s Labour conference. 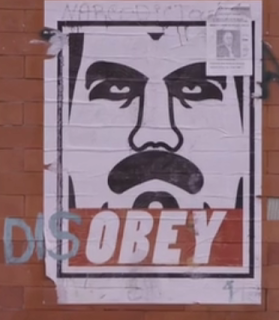 And that is all happening again now in Venezuela, complete with the opposition being described as fascists. The region's socialists, even those who worked for Allende, are being ignored. (Here’s Luis Almagro‏, the socialist former Foreign Minister of Uruguay, now the head of the Organisation of American States, on their most recent report on Venezuela). So are left-wing Venezuelans living in Europe who have attacked the "salon revolutionists" and the "mouthpieces of the regime". So, indeed, are the Venezuelan anarchists condemning the regime, and the human rights organisations. Labour's ”official statement” (as Emily Thornberry described it) on Venezuela was a solipsistic concoction produced on the quiet and simply intended to deflect, to have a rebuttal tool that can be waved around to say 'see, we did do something'. At the Parliament debate several Labour MPs did just that when poked by Tories about Corbyn, even though it bore no connection to their other statements in that very debate. For example, when Shadow Foreign Minister Helen Goodman MP, condemned the "sham" election - despite the fact that Labour’s "official statement" did not condemn the election. What Labour really thinks could be divined also from what Helen Goodman said in the parliamentary debate, where she took a swipe at the Venezuelan opposition (which is extremely broad and includes ex-Chavistas like the former Attorney General Luisa Ortega Díaz). Goodman even questioned that the talks should be between the government and the opposition at all. And Shadow Minister Chris Williamson MP has been all over the media defending the regime. Journalists are simply not asking the questions they should be asking, such as “Do you support possible EU sanctions and the ones Canada just imposed? Why don't you ask Nicolás to release political prisoners? This creates an environment where people like Kevin Maguire seemingly can get away with casually insulting not just MPs but people like Ivor and Lisa and Marifel, and the people of Venezuela as well. As if all that matters for the party is not concern about this huge humanitarian crisis but protecting the Party Leader. I’m told endlessly that the voters just don't care about foreign policy. But if you are going to start talk about an 'ethical foreign policy' then expect questions about the pesky policy details you'd rather just skate over. The author would like to thank Bob From Brockley for his assistance. Note: Since publishing this article, the Venezuelan embassy has responded to the author. We have published their response here.